I'm going to tell you about Lebanese man'oushe—a flatbread with endless possibilities for toppings and flavorings—and I'm not going to make the inevitable comparison to the dreaded "p" word. You know the one I mean. P*zza. It's gotta be rough to have a long food history— and what amounts to a national dish—only to have people say, "Oh yeah, that's (fill in your ethnicity/country of choice) p*zza!" So I'm not gonna go there. At least I'll try. Man'oushe is arguably Lebanon's signature dish, most often topped with za'atar and consumed for breakfast—and in the past, baked in communal ovens or brought to a local baker to be baked and taken home—but there are as many variations as there are Lebanese people. In her book, Man'oushe: Inside the Lebanese Street Corner Bakery, Barbara Abdeni Massaad has tried to collect as many of them as possible and the result is a comprehensive collection of recipes and a beautiful history of both this wonderful bread and the rich culture from which it came. Vegetable pies, cheese pies, meat pies, endless combinations… You can see why man'oushe is so popular and why it deserved its own book (one you should definitely add to your collection). I went for the traditional man'oushe here—topped with za'atar, a simple but heady blend of wild thyme, sesame seeds, salt and lemony sumac mixed with fragrant olive oil. The dough is rolled into rounds (Italians around the world are probably clutching their hearts right now—but THIS IS NOT P*ZZA! ), then topped with the za'atar mix and baked until it's slightly golden. The resulting bread has a great tooth (chewier than p*zza—see how I'm not comparing?) that's hearty and filling. I had it plain for breakfast and it was awesome, but it's also a great vehicle for other toppings—here olives, tomatoes, cucumbers, fresh mint from the garden, pickled turnips (that pink color comes from beets and it's REAL—no Photoshop tricks!) and a sprinkling of feta that rolled up into a bright and refreshing sandwich for lunch. We loved it, so much so that I'm thinking of baking my way through Barbara's entire book, not only because I'm up to my eyeballs in za'atar mix (thanks to an goof when I ordered my sumac and wild thyme) but because the wealth of recipe variations is so tempting. Thanks to Mireille at The Schizo Chef for this month's fun #BreadBakers yeasted flatbreads theme! 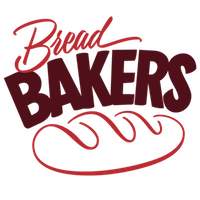 Be sure to check out the links below to see what the other BreadBakers were up to this month. Sift the flours and salt together in the bowl of a stand mixer, then stir in the sugar. Pour the lukewarm water into a small bowl, sprinkle the yeast on top and let sit for about 5 minutes. With the mixer on low, gradually add the yeast mixture and oil to the flour and mix. Turn the mixer to medium and knead until you have a smooth, soft dough, about 5-8 minutes. Place the dough in a lightly greased bowl, cover and set aside in a warm place for a bout 1.5–2 hours, until doubled. While the dough is rising, place a baking stone on the bottom rack of the oven and preheat to 400°F. Turn the dough out onto a lightly floured work surface, degas gently, the divide into four equal pieces. Cover the pieces and let rise for another half hour. Flatten each ball, then roll each into a round about 10" in diameter. Place the rounds on pizza peel (or inverted sheet pan), then top with 2–3 Tbsp of the wild thyme spread, spreading in to within 1/2" of the edge. Slide the round onto the baking stone and bake until lightly golden and bubbly, about 8–10 minutes. Remove from the oven, top as desired (or leave it plain) and serve while warm. Stir the ingredients together in a small bowl until combined. Note: This recipe makes a LOT but can easily be halved or quartered. Place 1 cup of the water in a small saucepan and heat to a simmer. Add the bay leaf and salt, stirring until the salt is dissolved. Remove from heat, cool to room temperature, then stir in the vinegar. While the mixture is cooling, peel the turnips and beet, then cut like french fries. Place the turnips, beet and garlic into a large jar or container, then cover with the cooled brine and bay leaf and remaining water. Cover and let sit at room temperature for one week, then store in the refrigerator. The pickles will keep for about 6 weeks. The trick for making round rounds is to keep turning the dough as you roll, a quarter turn each time. Much easier than turning yourself, which never seems to work. I found it a lot easier to spread the za'atar with my fingers than with a utensil like the back of a spoon. And less is more. You don't want to load up on the za'atar. I used a french fry cutter to cut the turnips—because doesn't everyone have one?—but it certainly isn't necessary. Just cut 3/8" x 1/2" fry shapes and save yourself something else to wash up.